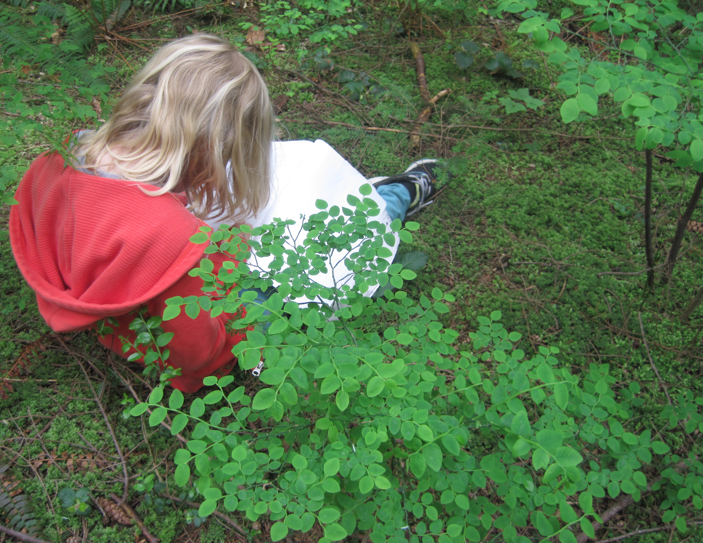 There is nothing quite like the magical calm that descends over a classroom of children when they are nestled into the forest, focused and writing. This is the second year that I have taken advantage of our school’s natural setting for the purpose of inspiring poetry and simply maintaining my students’ interest in working at this restless time of year. You would think that I would have thought of doing this years ago, but better late than never! The poetry that my students produced last year was so diverse and amazing that I was curious to see if I could replicate the magic again this year. I am certain that the natural setting made all of the difference, although it does take a little teaching to make them aware of what poetry can be. In the classroom, I’ve broken poetry analysis down in a very simple way. I find that we can get a little too caught up in fragmenting poetry with all the metaphors, similes, onomatopoeias, personifications, rhymes, meters, and alliterations (etc, etc). I want students to be aware of these devices so that they might try them or appreciate them, but I would like them to feel comfortable with the big picture of poetry and to use the devices when and if they choose. In other words, I would like their work to surprise me. Does this poem have parts that are fun to hear or say? If you answer yes, then you need to find out why. Here is where the awareness of repeating sounds (rhyme and alliteration), rhythm, and “dramatic words” (including onomatopoeia, but not confined to them) comes into play. Does this poem help you know or understand a subject? If you answer yes, then you are in the territory of the five senses. Which senses did an author use to help you understand the subject more clearly? This is the more literal, detail stuff. Is this poem imaginative? I’m still tweaking this category, but I want students to be aware that authors use their imaginations to think of what the subject reminds them of. This is where you get into figurative devices and analogous thinking. Plus, I wanted to include story poems here, too. Is this poem interesting to look at? Shape is important in poetry, too. This is fun to play around with. For each of these categories, I have assigned a visual icon. The first category is represented by an ear and mouth, the second by a light bulb (not perfect, but okay), the third by a thinking bubble (again, not perfect but will do), and the fourth by an eye. When reading and writing poetry, I get them to draw the symbols for the categories that they are recognizing in both their own poetry and the poetry of others. At this stage of the game, I am letting them read a lot of good poetry and I am giving them opportunities to try writing their own, out in nature, with more inspiration than direction. I have a whole stack of student journals to go through this weekend with personal reflections on the process and selections of favourite poems (or part of poems) that each has written so far. A piece of advice: don’t be too hasty to seek a tidy poem or a good copy too soon! This journal reflection is a perfect way for them to reflect on their own writing and get a little feedback as they develop as poets. This is a helpful structure that I would like to apply to an environmental poetry writing activity that we do with ESL teachers from overseas who visit the Mossom Creek Hatchery. Thanks!